DJO ProCare 10 Inch Double-Pull Sacro-Lumbar Support is soft and semi-rigid to support the spine as well as the abdominal muscles. The elastic brace, sometimes referred to as a lumbar corset, is designed with four vertical 9-inch posterior plastic stays to hug and support the spine. The plastic stays create semi-rigid support to add lower back stability in addition to the middle strap that fastens to each side to customize the compression. 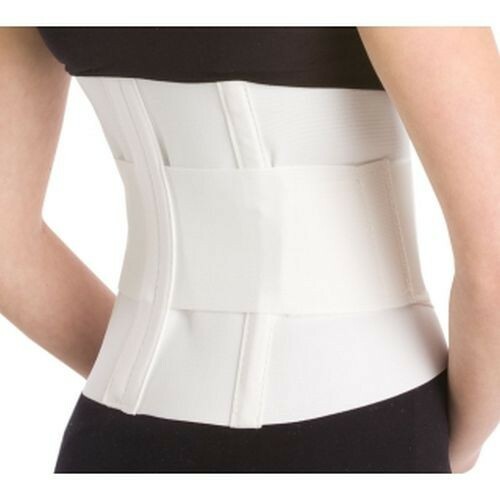 The brace is 10 inches long and made of elastic to naturally contour with the torso. Back Braces & Lumbar Support are worn to nurse an injury, spinal condition or to prevent an injury when lifting heavy objects. ProCare Sacro-Lumbar Support with Compression Straps is unisex and is available in a variety of sizes to fit based on waist size. Bed Comfort Pad for pressure point relief while patient is lying down in bed. Other sacrolumbar supports manufactured by DJ Orthopedics is the Lumbar Support with Criss-Cross Straps adding double neoprene compression straps.